The never-ending search for vintage treasures leads us to some incredible finds! We were excited when we stumbled on this interesting antique – a real treat for home decorators, upcyclers, collectors, and movie buffs alike! Craig Thalhammer Cinema Tripod by Craig Movie Supply Co. Lights, camera, action! 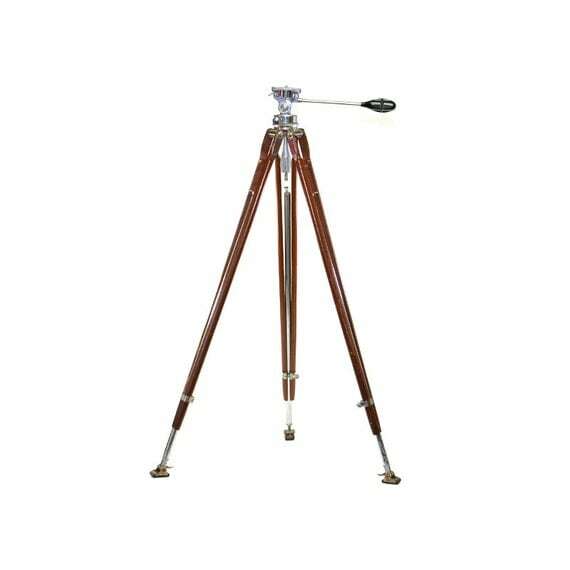 Add a hint of Old Hollywood to your home or upcycle projects with this authentic antique Craig Thalhammer cinema tripod by Craig Movie Supply Company of Los Angeles, California. 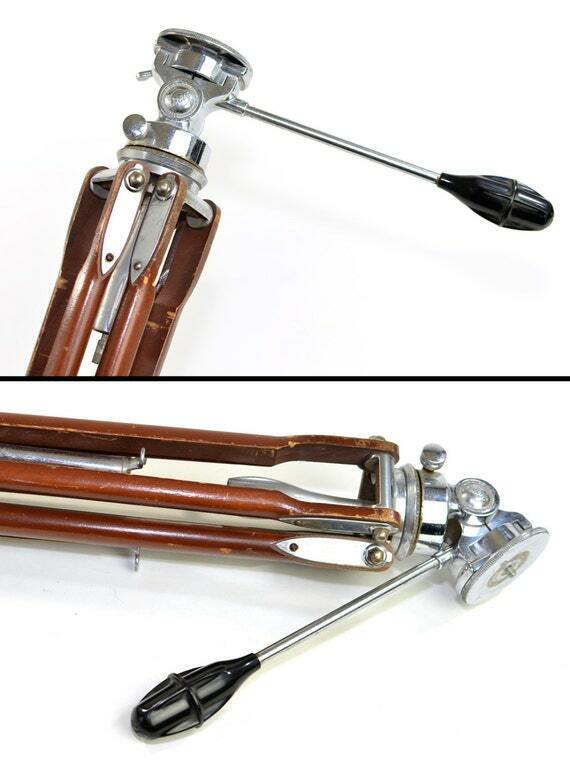 This unit is complete with all original parts and equipment, including “rigidized” two-section legs of hardwood and chromium-plated steel, Craig’s “Sure Foot” points that pivot from rubber tread to spur for a steady grip on any surface, and patented Kino Pano tilt head (model T-98) with secure camera-mounting point. The tilt head offers a full 360 degree pan and 125 degree tilt, with numbered dial on the base. Handle extends out with an easy-grip black hard-plastic bulb tip. This tripod is in good used vintage condition. As far as we can tell, this unit is totally complete with all parts in good working order. 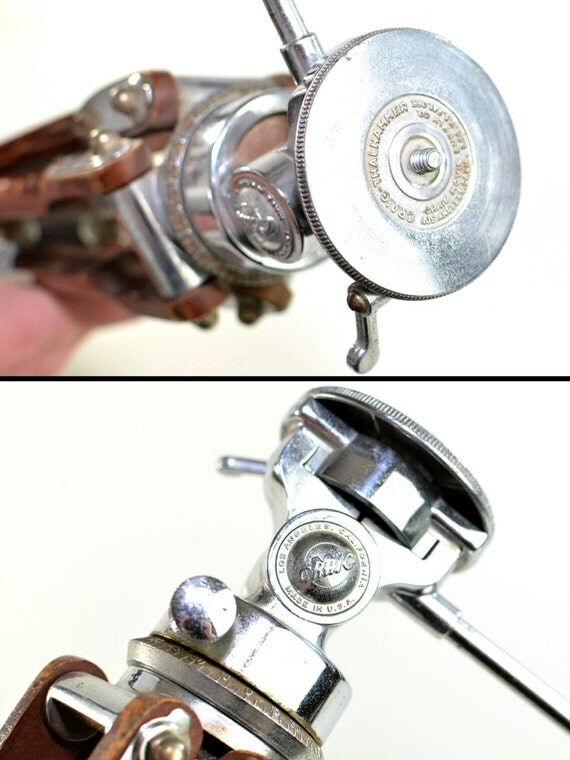 All knobs and adjusters turn smoothly and are functional. Legs extend and retract fully, without hesitation. The tilt head itself secures perfectly to the tripod, with only a tiny bit of loose “wiggle” which should not affect its functionality whatsoever. The legs swing open and closed very loosely, very easily. There is wear overall, showing great character of age, including scuffs, scratches, and surface blemishes to all wood areas. Plenty of gorgeous patina and surface wear apparent to all metal components, too – heaviest in the foot areas. An iconic piece of history by one of the most well-known names in movie supplies – an interesting accent for any home space and a unique gift idea for the movie buff in your life!